After the recent debate on Andy Warski’s YouTube channel between Greg Johnson, the Academic Agent and others, the Academic Agent posted a series of videos arguing against Greg Johnson’s positions. In one of them, childishly titled Greg Johnson Doesn’t Understand History, he tries to explain historical progress from a libertarian standpoint. His basic argument is that economic freedom was the only cause of progress in the sixteenth and seventeenth centuries and economic restrictions the cause of stagnation in medieval Europe: “…why was Europe held back from such a prosperity for such a long time? There’s only one real reason: capital control, which artificially distorted markets and killed economic growth.” Although he mentions the Jamestown colony in Virginia, and argues that economic freedom saved it from extinction, there is, however, no room for the discovery of America itself in this story. The continent itself is of course of inestimable value, and moreover, the discovery of a new continent, and the transportation of thousands of men and equipment for settlement across the Atlantic, already presupposes tremendous advancement in navigation and of society itself. Much of the freedom of colonial America and the early United States was a fortuitous freedom, born of the sheer diversity of local despotisms, too numerous and widespread to unite and overcome one another. A leading American historian has observed: “In none of the colonies was there anything that would today be recognized as ‘freedom of the press.’” Religious freedom was equally scarce. In 1637 the Massachusetts Bay Colony “passed an ordinance prohibiting anyone from settling within the colony without first having his orthodoxy approved by the magistrates.” A Puritan leader declared that other religionists “shall have free liberty to keep away from us.” […] In late Colonial America, “the only place where the public exercise of Catholic rites was permitted was Pennsylvania, and this was over the protest of the last governor.” It was from this “decentralized authoritarianism” that a “great diversity of opinion” came, not from toleration in principle but from “the existence of many communities within the society each with its own rigid canons of orthodoxy. Perhaps the Agent should talk less and read more of his own books. In the debate on Warski’s channel, he claimed that nations fail for instituting repressive policies and that there are “only basically inclusive institutions and inclusive societies that give people the freedom to flourish out, or there are extractive totalitarian ones that shut all of that stuff down and they all fail.” Ignoring this false dichotomy, the truth is the exact opposite. One need only look at a world map, one that shows the borders of nations and colors them differently, a so-called political map, as opposed to a physical map. The separation of peoples according countries is also indicative of separation according to race, ethnicity, language, culture, etc. (with exceptions of course) and it is the result of a long historical evolution. The inclusive societies did not do very well in this historical evolution and are not with us today. Where more than one nation was artificially put into one country, there has usually been trouble, and the borders of those countries were usually not made by those nations themselves. The current inclusiveness of Western countries is nothing but their ongoing dissolution, though they still live on the inherited moral capital of the past. But such a state is not the result of long historical evolution and cannot be, it has rather been imposed artificially on societies that were already highly developed. One would not be surprised if the Agent would infer that since crime and drug problems often accompany developed nations, they must be among the causes of their development and signs of health. After all, there were no such problems under Stalin, were there? Surprisingly, the Academic Agent seems not to distinguish between the regulation of behavior, and governmental economic control or central planning. Thus, he argues against the former with examples of the latter. It does not interest the Agent, that societies everywhere and at all times have found it necessary to regulate behavior, nor does it induce him to inquire why. Rather, he just seems completely oblivious of what libertarian epistemological humility is. Why are castles and walls from earlier times found in so many places? Were they perhaps symbols of inclusiveness and hospitality to the stranger? Is the Agent going to tell us that those who built those structures didn’t know what they were doing, but that he does? There is also a recent video on the popular Alternative Hypothesis channel, titled The European Revolution, that shows a similar one-dimensional view of history, but this time from the perspective of race and genetics. First, I must say that I’m not arguing against the facts presented in the video or that they played a role in the advancement of European society, but rather that they are only part of the story, not the whole story, as is claimed. The basic argument is that there was a great genetic change in European populations between 1000 and 1800. The most violent men were removed from the gene pool by frequent executions, and the richest replaced the poor by having much more children. This led to unified markets and modern economies, thus making mechanization and the Industrial Revolution possible. That may be true to some extent, but that “this is the most important series of events in all of history,” I am not as sure of. …there’s a very dangerous argument, and it’s so common and so destructive, and it’s that the European revolution wasn’t this measurable and proximate genetic change, but that it had something to do with Greece and Rome. […] When I say that the world before 1500 was mostly stagnant with not much going on. It’s not because I’m ignorant of the Roman Empire […] it’s just that I have a little bit of perspective, and the fact is that not a whole lot happened in the Roman Empire. They fought a bunch of wars, they held a bunch of land, but otherwise very little happened in a very long period of time. But why is it dangerous and destructive to think that Greece and Rome had something to do with the advancement of Europe? Isn’t it probable that the Renaissance with the proliferation of ancient Greek and Roman literature, philosophy, ideas and learning had something to do with the scientific revolution in the sixteenth and seventeenth centuries? And to say simply that the Romans “fought a bunch of wars” and “held a bunch of land,” is nothing but disgraceful. Who describes the Roman Empire like that? Who, “but Greeks and Jews and slaves?” One can only have contempt for such frivolity and ignorance. No, the Roman army that was victorious beyond belief is a worthy object of study, and so are the organizational abilities, administration and logistics needed to keep the empire functioning and unified for such a long time. And most importantly, should their beliefs and attitudes, the basis of their renowned loyalty and courage be studied. They deserve our highest admiration. It is also said in the video that: “It is dangerous to elevate some sort of philosophy or some sort of set of ideas, because you end up not jealously guarding the most important thing that has ever happened.” Is it not possible to cherish philosophy, ideas and one’s own people at the same time? Is it even possible to guard one’s own people without some philosophy and ideas? The apathetic aren’t doing very much. It also is no argument to say that these ideas mean nothing because they were available in Spain, Italy and in the Arab world without having similar effect there as in northern Europe. One might as well infer that if seeds fall on both fields and rocky ground, and the fields bear fruit but not the rocks, the seed availeth nothing. 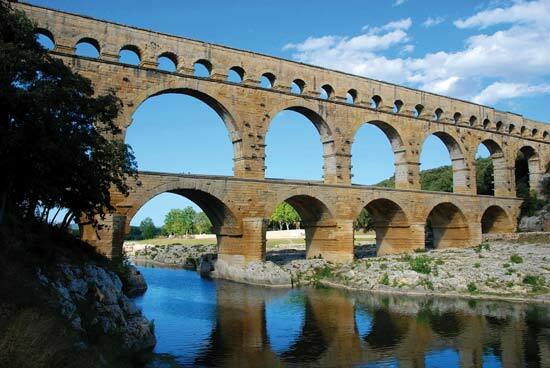 It is emblematic of the spiritual disease of modern man that people can vacation around Europe and see the monuments from the Roman era, the aqueducts and bridges, still standing, without asking with the curiosity of a child: Who built that? For what purpose? Who was here before me that was greater than I? These are structures that instantly command reverence from a sound spirit, who immediately makes a distinction between what he has just seen and the modern city where he lives. Not only are they aesthetically more pleasing, but also intellectually, because implicit in everything is purpose, not only of the particular structure, but also the seriousness, vigor and the direction by which men in earlier times lived. One may liken this difference to a walk in the forest and come across a skull half buried in the ground. Only a completely inane fool would think nothing of it, reckoning it as significant as some stone, others would instinctively begin to inquire further, in their heads, being affected by the experience. Analytic philosophers of history most commonly approached these issues on the basis of a theory of causation drawn from positivist philosophy of science. This theory is ultimately grounded in Humean assumptions about causation: that causation is nothing but constant conjunction. […] This approach to causal explanation is fatally flawed in the social sciences, because universal causal regularities among social phenomena are unavailable. Throughout history a living, active, creative, and responsive soul is present at all times and places. Every first class document is an expression of such a soul. That these documents are so scarce for a certain period results from the selection which history, in the form of memory, makes from the piles of what is written. It allows all that has no meaning to fall to dust, ashes and rags. The hermeneutical approach to history tells us that in order to understand a historical document or physical structure or other artifacts from the past we must try to recreate the consciousness of those who wrote the document or built the structure, and also try to understand their social and physical surroundings as they pertained to them. What were their aims and what were they responding to? We do not associate swords, spears or walls with peace or inclusiveness. The near-universal prevalence of symbols of warfare scream from the past that pacifism and inclusiveness is a lie! They mean nothing but death for the fool that falls for those spiritual diseases. No, attentiveness to the inescapability of warfare and that human life also is struggle is what it means to be ethical in the highest sense, if we accept Schleiermacher’s definition of ethics as the science of the principles of history. Destructive to life, not only to only to the life of the whole but also to that of the individual, is the direction which raises to pre-eminence the physical well-being of the individual, […] The course of world events shows that behind the direction which strives energetically to rise up over the merely natural and egoism there lurk chaos and death. Thomas Sowell, Knowledge and Decisions (New York: Basic Books, 1980), p. 316. Wilhelm Dilthey, Pattern and Meaning in History: Thoughts on History & Society, ed. H. P. Rickman (New York: Harper & Brothers, 1961), p. 67. Adolf Harnack, Adolf von Harnack: Liberal Theology at Its Height, ed. Martin Rumscheidt (Minneapolis: Fortress Press, 1991), p. 59. Published: January 30, 2018 | This entry was posted in North American New Right and tagged Academic Agent, Andy Warski, articles, Asklepios, debates, Greg Johnson, libertarianism, North American New Right, originals. Both comments and trackbacks are currently closed. It is emblematic of the spiritual disease of modern man that people can vacation around Europe and see the monuments from the Roman era, the aqueducts and bridges, still standing, without asking with the curiosity of a child: Who built that? For what purpose? Who was here before me that was greater than I? Structures that instantly command reverence from a sound spirit, who immediately makes a distinction between what he has just seen and the modern city where he lives. Not only are they aesthetically more pleasing, but also intellectually, because implicit in everything is purpose, not only of the particular structure, but also the seriousness, vigor and the direction by which men in earlier times lived. One may liken this difference to a walk in the forest and come across a skull half buried in the ground. Only a completely inane fool would think nothing of it, reckoning it as significant as some stone, others would instinctively begin to inquire further, in their heads, being affected by the experience. This is a really profound observation, but the problem is even worse than what is described. People take for granted the modern structures all around them too! It reminds me when the chauvinist behind Men Are Better Than Women (his name escapes me) was on a talk show being attacked by the women in the audience, and he reminded them that every brick in every building they have ever laid eyes on were put there by men. Your later section on the prevalence of fortresses and weapons throughout history goes nicely with it. In any case, thanks for taking one for the team and actually sitting through Academic Agent for us. …and he [ the chauvinist behind Men Are Better Than Women] reminded them that every brick in every building they have ever laid eyes on were put there by men. And a lot more than just bricklaying. If 99% of everything enjoyed daily by dimwitted feminists was not actually constructed by men, then certainly they were invented by men. There is no sin greater than ingratitude and unthankfulness. However, men aren’t “better” than women. One way or another, you still seem to want us. Even the fat, ugly, lazy or stupid among us manage to snag a man. Masterson is quite correct, actually. I noticed in college (1980s) that all the math (Calculus, Diff. Eqs., Probability, Statistics) and the great majority of the Physics and Chemistry (found in textbooks) was worked out or figured out by the year 1900 (nice roundabout year). What little came during the 20th century was before, say, 1950; a year I think most could agree the mass participation in college was well underway. For some reason, nothing or not much has happened in the last century with regard to science/math, meaning discovery/advance. Plenty of technological advance for the consumer/society, yes. Colleges (and thus their products (i.e. graduates)) do not seem to be producing discoveries or advances, despite mega funding opportunities by gov’t despite it being largely done by private funding in the past. And this funding, along with transportation abilities, allows the last century’s people to gather many more of the their “smart/inventive/creative” people than before. Not many as before were relegated to a life of farming/agriculture, mining, and other pursuits wherein high IQ was in some’s views wasted. I would say that many of the faculty and, worse, administration of colleges, post 1950, were either female or feminine-minded males (the prototypical image of the college boy sissy; doesn’t look to have much testosterone). And these do not produce as many scientific advance as masculine minds (almost entirely male). Plus, they are more tolerant of the shenanigans that go on in colleges; political correctness, worthless studies such as women’s studies, afro american studies, lesbian/homo studies. Curriculums that have little/no academic worth; for individuals or society. Not to mention the constant protesting and disrupting of colleges. Real masculine minds wouldn’t put up with it. What is a group of libertarians called? A sperg? Another great essay, Asklepios. Very even-handed and well-considered.